I’ve been reading Germinal by Emile Zola. I’ve never read anything by him before, and I’m so happy to have discovered him. It’s like Dickens with more sweat and pee and nakedness. Germinal is the tale of French miners in the late 19th century. They work more than five hundred meters below the earth, in cramped, dangerous, miserably hot, miserably cold, horribly dark and dangerously coal-dusty conditions for less than a living wage. They live crowded together into a cramped two-room house where they have no privacy and little peace. Their cupboards are literally bare, and their breakfast is hot water poured over yesterday’s coffee grounds. They’re all tired and anaemic and tubercular. And yet they’re very much alive, and full of humor and affection and desire. The story of their day-to-day life, the work the men and children do in the mines, the work the women do in their homes, is told in detail so rich and gripping you’ll find yourself hanging on every word, waiting impatiently to see what happens next. All of the characters are described with such warmth and generosity that I feel I’d like to know them, though I’d have trouble justifying the comfort in which I live, in which I expect to live. 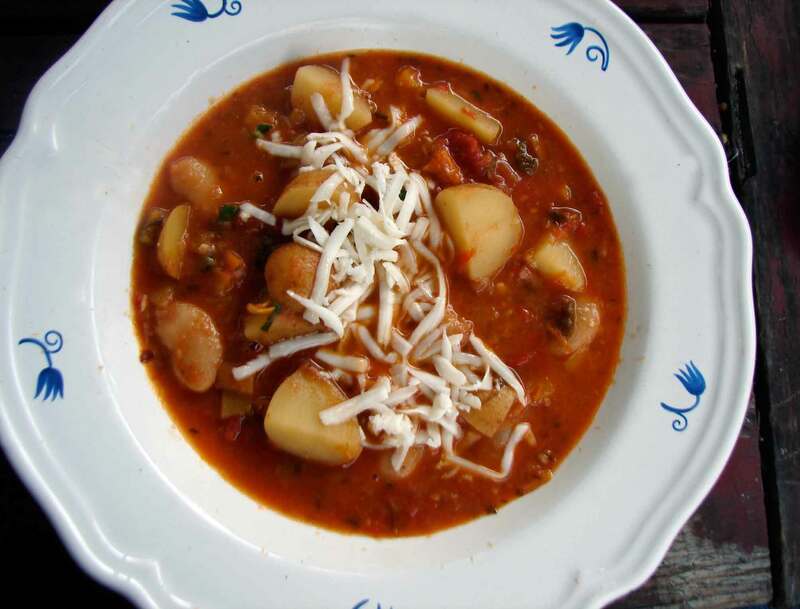 When La Maheuse finally manages to beg and plead for some supplies, she makes a soup of potatoes, leeks and sorrel. We just got some leeks and potatoes from the farm! So, of course, I had to try to make a French coal miner’s stew. I added herbs and butterbeans and wine and red peppers tomatoes. I don’t have sorrel, so I used lemon juice to attain that lemony flavor. I thought it turned out very tasty! I made a big round loaf of bread to go with it, but you could always just buy a baguette. In a large stew pot over medium heat, melt the butter. Add the shallot and garlic, stir and cook until the garlic starts to brown, after a minute or two. Add the leeks and herbs, stir and cook again for a few minutes, until the leeks start to wilt and turn translucent. Add the potatoes. Cook until they start to brown and soften, maybe five minutes. Add the butterbeans and white wine and scrape the bottom of the pot. When the wine is thick and syrupy, add the tomatoes and peppers. Cook until the tomatoes are soft, a few minutes, and then add enough water to cover everything by about 1/2 inch. Bring to a boil, reduce heat and simmer until the potatoes are soft, 25 to 20 minutes, depending on the size of the potatoes. Add the sugar, lemon and salt and pepper. Scatter the basil over top and serve. 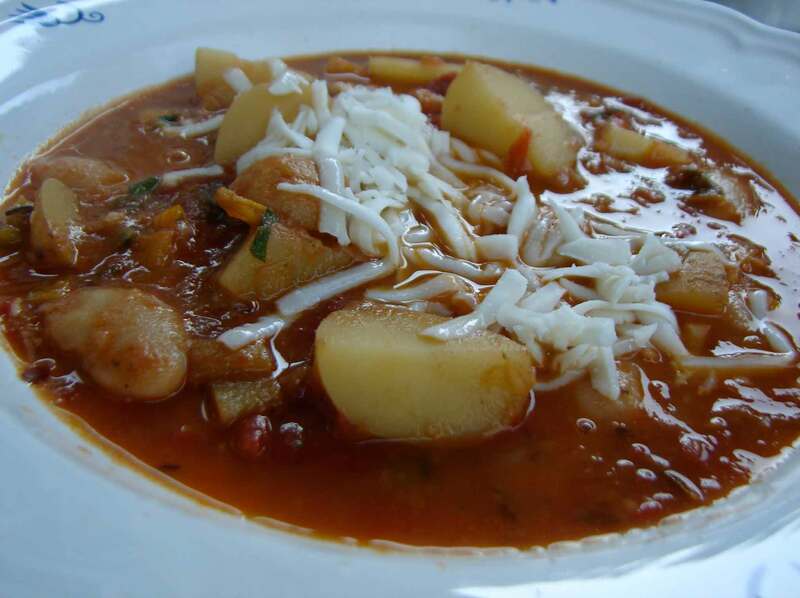 This entry was posted in beans, potatoes, recipe, soup, tomatoes, Uncategorized and tagged butterbeans, french miner's stew, germinal, leek and potato stew, summer stew by Claire. Bookmark the permalink. Finally had time to listen. Beautiful song, TFD!! This is the thing that always gets me about coal miner stories…it sounds like such a horrible job to me, but they seem to like it. When they strike it’s not that they never want to return to this strange space under the ground, just that they want a living wage for it.